The Five College Center for the Study of World Languages instructs students in dozens of less commonly studied languages each year. Photographer Nancy Palmieri recently visited conversation sessions that are a part of the center’s Mentored Language Program. 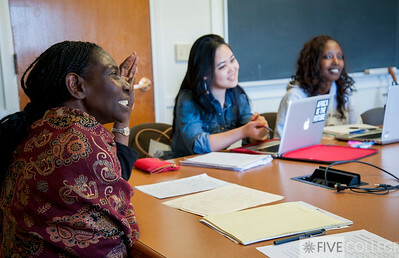 Pictured here are a session in Swahili III-IV led by Dr. Agnes Kimokoti, a session in Swahili II led by Nifasha Rusibamayila and a session in Hindi I led by Bhawana Pillai.